The first rule of gardening is to be COOL, and to do that, you never pronounce the word "herb" with an "h"! You ignore the "h" and just say "erb." Just kidding: but actually, you want to sound really smart about gardening, you should pronounce garden terms correctly. Everybody will be amazed at how COOL you are, to know so much about our friends, the plants. Now, basil (pronounced BA sill) is an herb that everybody loves to grow, because it is just so important in flavoring some of our favorite foods. Do you like pizza? Spaghetti? Pasta of all kinds? Then you probably know, or will recognize, the wonderful scent and taste of basil. It's a really common herb that goes beautifully when grown with - and cooked with - tomatoes and peppers in particular. Basil hates the cold, so in most parts of the country, you have to grow it as an annual plant, that won't come back from year to year. 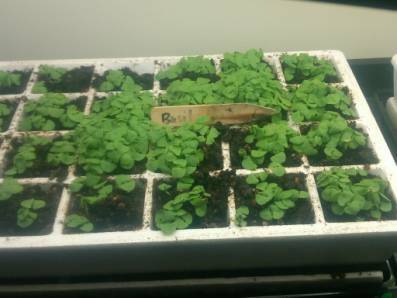 Most people start seeds indoors several weeks before the last possible chance of frost, and transplant the basil outside into the garden when the spring days and nights are both pretty warm, usually in late May. This is 'way too many seedlings in each "cell" of the seed-starting flat. The seed packet cost $1.29 and was two years old, so the kids thought they'd better max out on the seeds this year, because they weren't sure they would still be good next year. They needn't have worried! It looks like every single seed sprouted! When these seedlings develop their first set of true leaves and stand about 1" tall, it will be time to give each seedling its own "temporary" home before being planted outside. If you have a booth at a Farmers Market, a very popular spring item in May is a 4-pack of basil seedlings, ready to be planted in the customer's garden. Basil seedlings should be at least 4" to 6" tall to be fragrant, sturdy and ready for sale. Getting basil ready to sell or plant in the garden is a two-step process: you start the seeds under lights, and then you transplant the seedlings into their own homes once they're tall enough. The seedlings in this picture are 'way too crowded. Of course it would be easier to transplant these tiny seedlings into individual cells if they were started more scarcely, with just one or two seeds to the start-up cell. But it can be done, without killing most, or any, in the process. The roots may be entangled, but if you make sure to water the cells the day before so that the soil is moist, you should be able to coax them apart easily. All you have to do is take a teaspoon and lift each clump of seedlings up and out of the cell. Don't touch them with your fingers, or you're likely to smash them. Use a rounded-end toothpick or a craft stick to separate each seedling. Then transplant into individual cells (6-packs, perhaps?) with moist, organic potting mix. You can place these separated seedlings back under lights, or harden them off by leaving them on a back porch for a day or two, then in the shade outside for a day or two, and then in a place where they will get maybe an hour or two of direct but gentle direct sun for a day or two, and then give them full sun for a week or two 'til you transplant into their final garden destination. The main thing to remember in growing basil is to keep the plants well watered, and "side dress," or add handfuls, of compost around each stem about every two weeks. When buds and flowers appear on your basil plants, pinch them off. That will put all the energy into the leaves, which is the product that you want to develop. To harvest, cut about 6" to 8" off the top of the plant, and bunch several together and tie with raffia. You should immerse the stems in water, like a bouquet. Do not refrigerate - that will turn the leaves black. Keep the basil out of the sun once it's cut, so it doesn't wilt. You can root more basil plants simply by cutting some leaves from your early crop and placing thenm in water to get roots to grow. When roots are about 2" long, transplant them back into the garden and keep well-watered 'til the plants start to grow. Fresh basil tastes soooo much better than dried basil, that fresh basil is in high demand during the fall, winter and spring months, when it doesn't grow outside. So if you are looking for a year-round money-maker, and have an indoor light system set up for your garden club, consider growing and selling basil! It might be the most valuable plant, per pound, that you could have for sale in the out-of-season months. Tell your customers that basil is a great companion plant for tomatoes and peppers. Its strong scent scares off harmful bugs! And when you make pasta sauce, there's nothing like fresh basil to bring out the flavors of the tomatoes and peppers. Mmmmmm!